We are a traditional village brass band, based in the West Oxfordshire village of Yarnton. 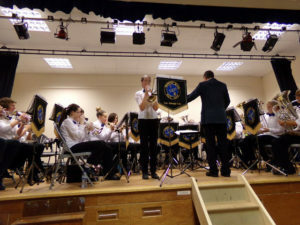 We welcome players of all ages and abilities with our training band offering support to those learning an instrument and the opportunity for more proficient players to progress to the senior band (though don’t mistake “senior” for “old”, the youngest member of the band currently is only 10). We play at number of events throughout the year including a programme of summer fetes, Remembrance Sunday, our annual concert in the Autumn as well as various carol playing events at Christmas. We are also active participants in the ODBBA spring Brass Festival. We are a registered charity and rely on a small annual membership fee, fees from event bookings and donations to keep the band running and offer the opportunity for new players to learn a brass instrument.